This site was a frontier outpost and a meeting place between European American and Cherokees of this region during the late 1700s. The first building here, known as Oconee Station, was built as a garrisoned fort for armed troops and included a military blockhouse. Its initial purpose was to protect white settlers in the area from Indian attack. Soon Oconee Station became used as a trading post. Trader William Richards came to live on the property in 1795 and, in 1805, built a brick residence next to the station building. other items. European guns made it easier for Indians to hunt deer, but weapons were also valuable to them in defense against their enemies. Though trade was beneficial to both sides, it was disruptive of traditional Native American life, particularly as hunters. The Indians bartered other goods such as baskets, ginseng, and snakeroot, but deerskins remained their main trade good until Indian removal from the Southeast. In exchange for their valuable deerskin, many Southeastern Indians received clothing made of European cotton and other fabrics, wearing a mixture of European and traditional Indian apparel. The attire of the white Americans living on the frontier also showed a blending. The fringed deerskin jacket associated with the frontiersman is European in construction but Native American in its materials and decoration. The sharing of material cultures between European-Americans and Native Americans revealed the amount of contact between these two groups and symbolized the complexity of their relationships, which ranged from inflamed animosity to friendly cooperation. points for new settlers. Scouts based in these stations roamed the frontier areas and served as an early warning network of imminent Indian attacks, giving the alarm to local white settlers. 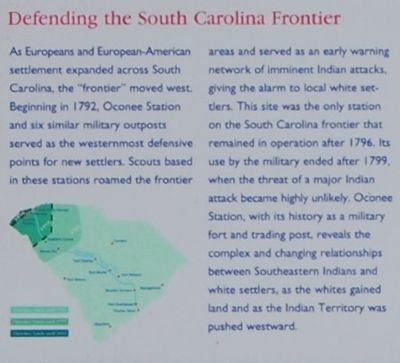 This site was the only station on the South Carolina frontier that remained in operation after 1796. Its use by the military ended after 1799, when the threat of a major Indian attack became highly unlikely. 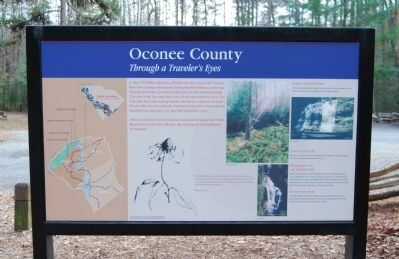 Oconee Station, with its history as a military fort and trading post, reveals the complex and changing relationships between Southeastern Indians and white settlers, as the whites gained land and as the Indian Territory was pushed westward. In May 1775 William Bartram, a British naturalist, crossed the Savannah River from Georgia and explored the Keowee River Valley in present-day Oconee and Pickens Counties. At that time, he was traveling through Cherokee lands. Two years later, most of this land would be lost to the Cherokee. Bartram's writings express the beauty of this part of South Carolina. Bartram was especially interested in the plants of the area. He sketched local species and described magnificent vistas. 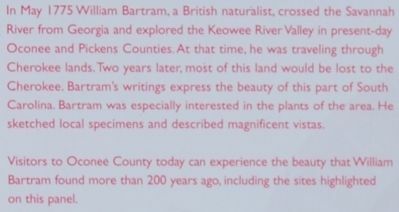 Visitors to Oconee County today can experience the beauty that William Bartram found more than 200 years ago, including the sites highlighted on this panel. site is withing Sumter National Forest adjacent to Oconee Station. It is an east mile-and-a-half from here. Spanning the border between North and South Carolina, Upper and Lower Whitewater Falls create the largest cascade east of the Mississippi. 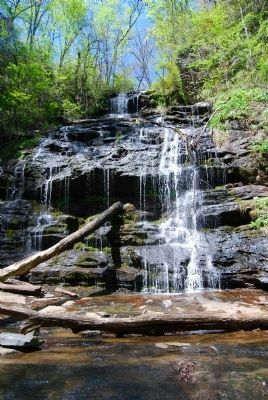 Here, hikers can access the Foothills trail, which winds 85 miles through dramatic terrain between the Carolinas. 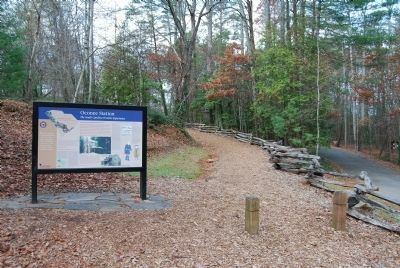 Additional access points to the trail are at Jones Gap State Park and Oconee State Park. 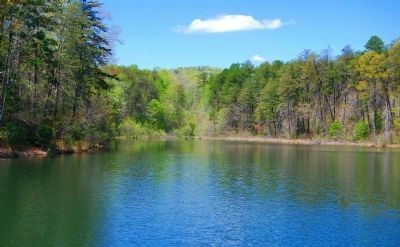 Camping, fishing, boating, and hiking are popular activities at this state park, which features recreational structures constructed by the Civilian Conservation Corps (CCC) during the 1930s. Marker series. This marker is included in the Civilian Conservation Corps, and the South Carolina Heritage Corridor marker series. Location. 34° 50.767′ N, 83° 4.208′ W. Marker is in Walhalla, South Carolina, in Oconee County. Marker is on Oconee Station Road. Touch for map. Marker is located at the foot of a walking trail leading to the Station and Richards House. Marker is at or near this postal address: 500 Oconee Station Road, Walhalla SC 29691, United States of America. Touch for directions. (approx. 2.3 miles away); Cherokee Boundary (1777) (approx. 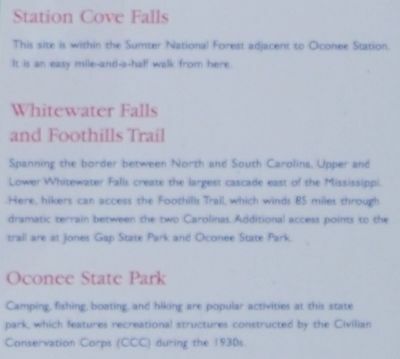 2.4 miles away); Oconee State Park (approx. 2.4 miles away); Civilian Conservation Corps Monument (approx. 2.4 miles away); The Civilian Conservation Corps (approx. 2.4 miles away); Tamassee Town (approx. 2.8 miles away); Issaqueena Falls (approx. 3.9 miles away); Stumphouse Mountain Tunnel (approx. 3.9 miles away); Stumphouse Tunnel (approx. 3.9 miles away). Touch for a list and map of all markers in Walhalla. The blockhouse was constructed around 1792 as one of a chain of such buildings established during a period of tension between white settlers and the Indians. 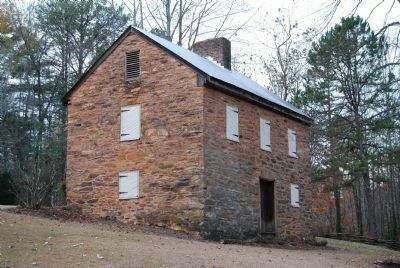 Oconee Station was the last blockhouse to be decommissioned in the state. Troops were removed in 1799. 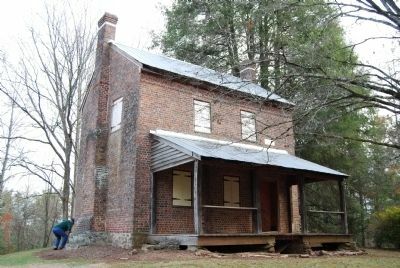 The brick house at Oconee Station, which sits near the blockhouse,was built in 1805 by William Richards, a native of Ireland. Richards established a successful trading post at Oconee Station. 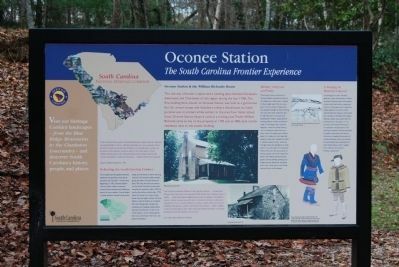 After the death of William Richards, along with the western movement of the frontier, Oconee Station's importance began to decline. The site is listed on the National Historic Register. — Submitted December 12, 2008, by Brian Scott of Anderson, South Carolina. Oconee Station is a rectilinear fieldstone building with gable roof with small windows in gable, wooden lean-to porch with four supports in front of central main entrance. Both front casement windows, which were originally loopholes, are set high on either side of entrances and are four-over-four. Colonial batten doors and shutters. Shutters also have long iron strip hinges. Walls are two feet thick. Interior has brick fireplaces, one on each floor, in large central chimney. In basement are old loom, spinning wheel, and bullet molds. 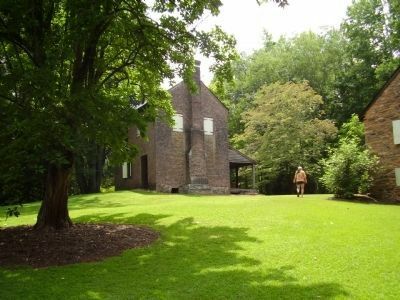 Richards House, adjacent to Oconee Station, has two stories and a basement, and is constructed of handmade brick laid in a combination of English and Flemish bond. House has fieldstone foundation, two-piece batten shutters with iron strap hinges, front façade entablature and lean-to porch. Also had end chimneys. Inside, house has two fireplaces on each floor. Brick parquet floor was recently discovered on ground floor, beneath about six inches of dirt. Second story floor is wood. Both buildings have been restored for use as a single summer home. Mortar has been added to the walls of Oconee Station and its interior has been redesigned to create bedrooms. The kitchen, living and dining rooms, etc. are housed in the Richards House. 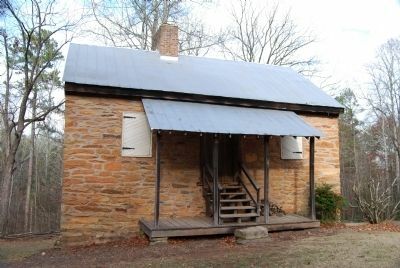 Oldest building in Oconee County, Oconee Station was erected before 1760 to afford the few settlers nearby a measure of protection against numerous Cherokee Indians in the area. Last of three guardhouses built by Lt. Col. Archibald Montgomery, who commanded English and Scottish troops in ill-starred 1762 attacks on Cherokees. Building marks farthest point in South Carolina to which white settlers ventured prior to the Revolution, and is believed to have housed British soldiers, at least periodically, until after the war. During the early 1800s the Indians used the building as a trading post. Later it became a storage place for furs, and then a residence. Path to the right leads to the Station and Richards House. More. 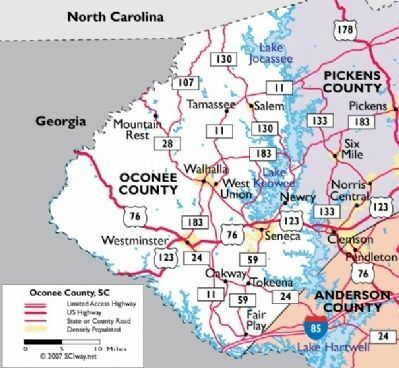 Search the internet for Oconee Station / Oconee County. Credits. This page was last revised on June 21, 2016. This page originally submitted on December 11, 2008, by Brian Scott of Anderson, South Carolina. This page has been viewed 2,623 times since then and 20 times this year. This page was the Marker of the Week January 4, 2009. Photos: 1, 2, 3, 4, 5. submitted on December 11, 2008, by Brian Scott of Anderson, South Carolina. 6, 7, 8. submitted on December 12, 2008, by Brian Scott of Anderson, South Carolina. 9. submitted on December 11, 2008, by Brian Scott of Anderson, South Carolina. 10. submitted on November 29, 2009, by Brian Scott of Anderson, South Carolina. 11, 12, 13, 14, 15, 16. submitted on December 12, 2008, by Brian Scott of Anderson, South Carolina. 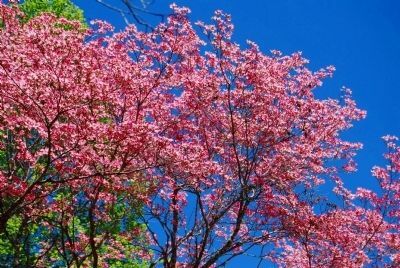 17. submitted on July 20, 2009, by Stanley and Terrie Howard of Greer, South Carolina.